Specialist in being as much of a generalist as possible. Dunno, exactly…I have very hazy memories of playing with a set of old Marx dinosaur toys in a room with gigantic paper cutouts of various dinosaurs in the early 1970s; my mom tells me I had those starting at age 2, so I have no idea what was my initial exposure. I also have (less hazy) memories as an older child poring over books such as McGowen’s Album of Dinosaurs and Craig’s Dinosaurs and More Dinosaurs in fascination. Of course, all of these books and toys are hopelessly outdated–even laughably so–by today’s standards, but they obviously piqued my interest. Somewhere amid all the baby/early childhood stuff my mom saved is something I wrote in second grade–this was on those gray, sideways, blue-lined pieces of paper on which children learn to print. The assignment clearly had been to respond to a question such as “If you could be any animal, what would you be and why?” My answer: Compsognathus. I don’t remember why. Spelled it correctly, too. But…but…I love _all_ of my children equally! In all seriousness, I have a particular fondness for some of the first papers I wrote, particularly the ones that describe the theropod track Saurexallopus, the pterosaur Kepodactylus, and a bunch of isolated dinosaur tracks from the Morrison Formation near Canon City, Colorado. Compared to what I think I could produce today, they’re not the greatest papers…in some ways, they are blatantly amateurish! But producing them having only a bachelor’s degree behind me was an extremely interesting, eye-opening process that really exposed me to what the meat of research paleontology really is, which is nothing like anything I’d ever seen in a book or TV show. Anyone seriously contemplating getting into paleontology should have this kind of experience at the undergraduate level. I have lots of fond memories of being surrounded by stacks of papers, in my apartment or a nearby coffee shop, trying to learn about so many different things, amalgamate and filter them, and apply them to resolve a problem. They’re not the greatest papers in the world, but they were the foundation of my education in how to be a research scientist and therefore are near and dear to my heart. 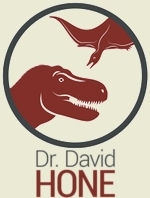 At the risk of psittaciforming Tom Holtz, feathered dinosaurs and the cementing of the birds-are-dinosaur-descendants theory (yes, theory…no longer a hypothesis). Of course, it opens up all kinds of new questions about how far we can push inferences about dinosaurs based on extant bird physiology/anatomy/behavior/etc., but that’s also a great thing–gives us paleontologists something to do! Also, the increasing application of all kinds of technologies to resolve paleontological problems. In particular, increasingly high-resolution CT scanning has provided some really interesting insights into aspects of dinosaur paleobiology that I bet no one thought we would ever be able to tackle even a generation or two ago. (On a tangential note, the increasing prevalence of 3D digitization and rapid prototyping will, in the not-too-distant future, make possible comparing specimens in far-flung reaches of the globe easier and cheaper than traveling a lot). Lastly, I’d say that the (again increasing) realization that non-avian dinosaurs don’t really have any modern analogs in terms of anatomy, physiology, and ecology–and that dinosaurs aren’t the big, sluggish, swamp-dwelling reptiles I grew up with–makes working on them so much more fun and exciting because it allows us to see where principles we think we understand from extant organisms aren’t broad enough to encompass much of the past, and try to figure out more inclusive principles as well as all the variables that made the past unlike the present and tease out their effects. As a teacher of scientific writing, and as someone who learned via trial-by-fire under the tutelage of someone unafraid to rip my writing to shreds, I have a personal interest in good writing. It’s also something I consistently fail to see from students, and something I see with alarmingly decreasing frequency in the literature. Frankly, if you want anyone to take your research seriously, write it correctly: use words properly and to maximum effect, structure sentences properly, use parallel structure throughout and across paragraphs and paper sections, and perhaps above all else, learn how to explain your reasoning in a clear, logical fashion. Beyond that pet peeve, obviously doing careful research is key. Often, that means doing detailed work, not glossing over various details that you think are unimportant, or that aren’t usually talked about in other papers. You never know what will be important in the future! Doing careful research also means examining all issues from multiple angles–these days, phylogenetics seems to be the favorite perspective, but functional morphology, paleoecology, sedimentology, stratigraphy, paleobiogeography, etc. all contribute valuable information. Be holistic, not narrowly focused…maybe not all in a single paper, but in approaching any specific problem. (Plus, this gives you ample opportunity to beef up your CVs! ).